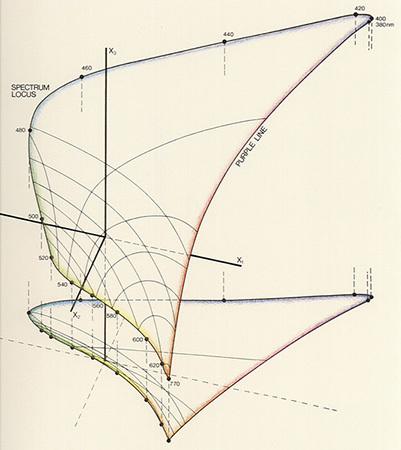 There have been many attempts at constructing a «visually homogenous colour-space» using either linear or non-linear transformations of the CIE diagram. However, as we have pointed out in the text to, these have never been successful. Accordingly, a metric in colour-space should describe the variation of colour induced by any two elements from the three-dimensional diversity of colours as perceived within the eye of an observer under set conditions of observation. In spite of the apparent simplicity of this task, its implementation is by no means straightforward: the shape of the curves of the line-elements depends on numerous measurements, complex assumptions and physical laws. It is impossible here to even begin to explain all the associated mathematical and geometrical intricacies; it is enough to just appreciate the aesthetics of the resultant colour-solids. The left-hand illustration is an example, based on a line-element first proposed by the American Walter S. Stiles in 1946. The idea of line-elements goes back to Hermann von Helmholtz, who had attempted to mathematically formulate the perceivable differences between additive colour mixtures. Within a colour-space, Helmholtz required all apparently identical or similar colours to be equidistant, and constructed his line-element with this in mind. Walter S. Stiles then modified Helmholtz’s proposals in order to better account for observations of threshold values. In the description of MacAdam’s system, examples of these values — the threshold ellipses which bear his name — have already been introduced. 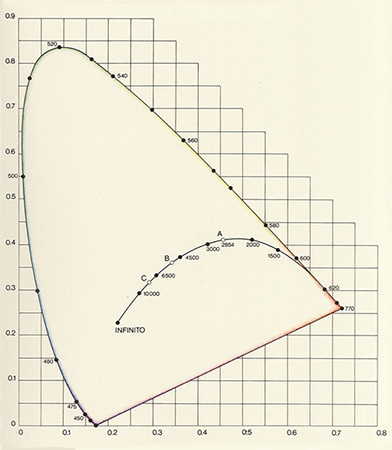 By means of a non-linear transformation suggested by D. Farnsworth in 1957, these regions of colour-sensation tolerance can be converted into circles, as shown in the right-hand illustration, which also depicts a similarly distorted outline of the CIE diagram (the spectrum locus and the purple line are still recognisable). 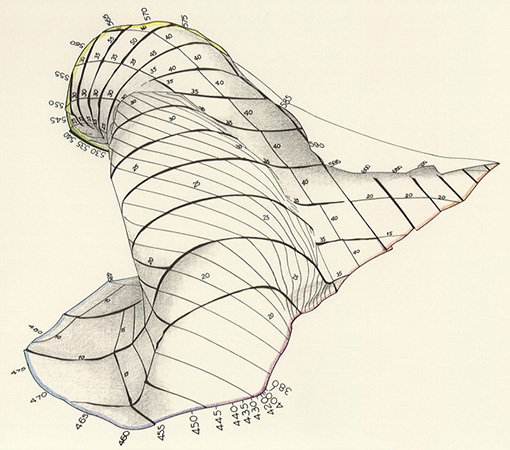 A total of twenty-five small circles can be seen — the twenty-five representative nominal-colours which MacAdam used to experimentally obtain his threshold ellipses. 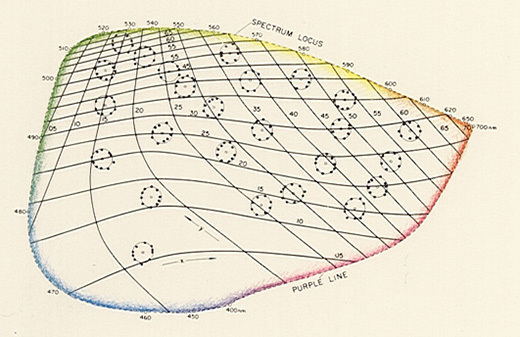 The purple line and the position of the spectral colours calculated by using the Stiles line-element can also be seen on the UCS-surface, which forms part of the left-hand drawing. The coordinates have been selected so that the standard light-source ‘C’ used in the CIE- diagram is located at the zero point of the new system of coordinates X1, X2 and X3. At the same time, the projection of the UCS-surface according to Stiles can be seen in the plane formed by X1 and X2. With this plate and the preceding system of D. L. MacAdam, we have departed the region once referred to by the physicist Erwin Schrödinger as the «terrain of lower colorimetry» due to its construction based on the assessment of colour similarity. MacAdam and Stiles are more concerned with the equidistance of colours, which in principle has little to do with their similarity, and we now speak of «higher colorimetry», which is indeed both complex and fascinating. However, to the colour enthusiast not directly occupied with such matters, such higher theoretical deliberations are of somewhat limited use. The experts appear to be isolated. Nevertheless, we can still look over their shoulders and allow ourselves a moment of wonder! Date: The geometrical portrayal of a colour-space originated in 1946. Bibliography: W. S. Stiles, «A modified Helmholtz line element in brightness-colour-space», Proceedings of the Physical Society London 58, pp. 41-65 (1946); G. Wyszecki und W. S. Stiles, «Color Science», New York 1967.